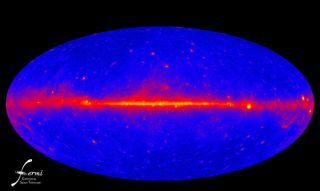 This view of the gamma-ray sky is constructed from one year of Fermi Large Area Telescope (LAT) observations. The blue color includes the extragalactic gamma-ray background. The map shows the rate at which the LAT detects gamma rays with energies above 300 million electron volts — about 120 million times the energy of visible light — from different sky directions. Brighter colors represent higher rates. In a new finding that could have game-changing effects if borne out, two astrophysicists think they've finally tracked down the elusive signature of dark matter. This invisible substance is thought to make up much of the universe ? but scientists have little idea what it is. They can only infer the existence of dark matter by measuring its gravitational tug on the normal matter that they can see. Now, after sifting through observations of the center of our Milky Way galaxy, two researchers think they've found evidence of the annihilation of dark matter particles in powerful explosions. Hooper conducted the analysis with Lisa Goodenough, a graduate student at New York University. The idea of dark matter was first proposed in the 1930s, after the velocities of galaxies and stars suggested the universe contained much more mass than what could be seen. Dark matter would not reflect light, so it couldn't be observed directly by telescopes.? Now scientists calculate dark matter makes up roughly 80 percent of all matter, with regular atoms contributing a puny 20 percent. Either way, the researchers think the Milky Way's gamma-ray glow is caused by dark matter explosions. By studying the data on this radiation, Hooper and Goodenough calculated that dark matter must be made of particles called WIMPs (weakly interacting massive particles) with masses between 7.3 and 9.2 GeV (giga electron volts) ? almost nine times the mass of a proton. They also calculated a property known as the cross-section, which describes how likely the particle is to interact with others. The researchers have submitted a paper describing their findings to the journal Physics Review Letters B, but it has not yet gone through the peer-review process. Not everyone is ready to accept that dark matter has been found. Hooper and Goodenough based their analysis on data released to the public from the Fermi observatory's Large Area Telescope. However, the official Fermi team, a large collaboration of international scientists, has not finished studying the intriguing glow. While they don't exclude the possibility that it is dark matter, team members are not ready to dismiss the possibility of another explanation. "We feel that astrophysical interpretations for the gamma-ray signals from the region of the galactic center have to be further explored," said Seth Digel, analysis coordinator for the Large Area Telescope collaboration and a staff physicist at the SLAC National Accelerator Laboratory in Menlo Park, Calif. "I can't and won't say what they've done is wrong, but as a collaboration we don?t have our own final understanding of the data." Fermi scientists stressed that the analysis of the Milky Way's center is very complex, because there are so many bright sources of gamma-ray light in this crowded region. Various types of spinning stars called pulsars, as well as remnants left over from supernovas, also contribute confusing signals. "More work needs to be done in this direction, and people within the collaboration are working hard to accomplish this goal. Until this is done, it is too difficult to interpret the data," said Simona Murgia, another SLAC scientist and Fermi science team member. Hooper agreed that the case is not yet closed. "I want a lot of people who are experts to think about this hard and try to make it go away," he said. "If we all agree we can't, then we'll have our answer." One reason he and Goodenough think they are on the right track is that their calculation of the mass of dark matter particles aligns with some promising hints from other studies, he said. Two ground-based experiments aimed at detecting dark matter have found preliminary indications of particles with roughly the same mass. The University of Chicago's CoGeNT project, buried deep in the Soudan iron mine in northeastern Minnesota, and DAMA, an Italian experiment underground near the Gran Sasso Mountains outside of Rome, both found signals that they can't completely attribute to normal particles, but can't prove are from dark matter. "Part of why this picture is so compelling has to do with those in fact," Hooper said. "I would argue that it's likely that all three of these experiments are seeing the same dark matter particle." Still, it will take a lot of work to convince most astrophysicists that such a slippery substance has been captured at last. "It's a complicated task to interpret what Dan and Lisa are seeing," said Doug Finkbeiner, a researcher at the Harvard-Smithsonian Center for Astrophysics in Cambridge, Mass. "I do not find it persuasive, but that doesn't mean it is wrong." Some scientists said we finally may be getting close to solving the mystery of dark matter. Michael Turner, director of the Kavli Institute for Cosmological Physics at the University of Chicago, said that between Fermi, the ground-based experiments, and the recently opened Large Hadron Collider particle accelerator at the CERN laboratory in Switzerland, scientists will likely confirm the existence of dark matter within the next decade. For now, though, he's still waiting. "This result is very intriguing but doesn't yet rise to the Sagan standard ? extraordinary claims require extraordinary evidence," Turner said. Other explanations would have to be eliminated, he said. "Nature knows many ways to make gamma rays."